Next review LeafFilter North - Quick follow-up. LeafFilter North - Not happy with the sales team and financing aspect of the whole process. Mar 01, 2018 Hi John- Thank you for your honest feedback. A manager will call you shortly to discuss your concerns. I agreed to have Leaf Filter redo some trim on my century home. I didn't want their gutter protection as it was way too expensive. During the sales meeting I expressed that I wanted a gutter replaced because it could not handle the volume of water during heavy rains and was creating an additional problem of flooding in my basement. I even pointed out a spot in my house where the gutter overflows and causes a moisture problem on the inside. The subcontractors showed up much sooner than I expected as it was bitter cold and snowing. They worked about a half day and left because they did not have the proper equipment to reach the height of an older two story home. I was led to believe that the material they were using was a Leaf Filter product that was perforated to allow for ventilation of the attic. However it was not perforated, installed directly over the old wood soffit and picked up at the ABC store in Hudson! Not to be confused with the ABC Liquor Store they told me! The next day I received a call from the salesman saying the price was misquoted and would like me to come up with $500 more! Gutter never was installed, I'm being billed for costs that I didn't want through their finance company which shows up on my credit report and looks unfavorable to my bank when I applied for a loan! Subcontractors were qualified, courteous, and underpaid! They were not surprised when I told them the work was not done and admitted there were other problems with other clients. Then they pointed out to me that there was no mention of a gutter replacement in the contract! Gutter people don't do gutters or buyer beware! I've been bamboozled by a team of con artists! 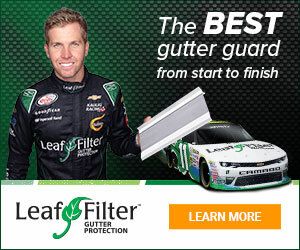 Product or Service Mentioned: Leaffilter North Gutter Replacement. I didn't like: Product not as promised. Review #1199989 is a subjective opinion of User1199989.